Sun shading when you want it! Retractable awnings and solar screens are very low maintenance. By design, they are self-storing when retracted. Taking a few simple precautions can add to the life and appearance of your products. 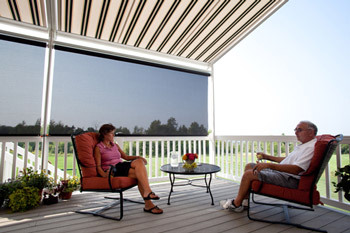 Retractable awnings are primarily designed to protect you from the damaging and harsh rays of the sun. They aren't intended for use at all times and in all weather conditions. 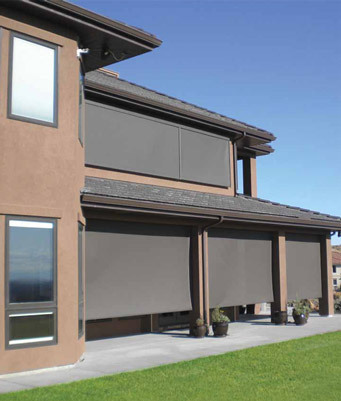 Automatic sun, wind, and rain sensors or timers extend the comfort and convenience of your awnings, but they can't replace your own attention and diligence. When you will be away from home for an extended period. When winds stronger than 18 mph are expected. Strong wind can damage retractable awnings. Wind is an unpredictable force that can quickly change direction and intensity. It's the wind's lifting up effect on the awning rather than its downward force that is the concern. Thus, the greater the pitch—the angle from the mounting height and the front of the awning—the more wind resistant the unit is. When persistent, heavy, driving, or freezing rain is expected. Water pooling on the fabric can cause damage and irreversible fabric stretching. The extra weight of the water can cause the metals bars and arms to bend or break under the load. Awnings with proper pitch may be extended in drizzle or misting rains when strong winds are not present. When frost or snow is expected. General rule for weather conditions: If you are comfortable sitting outdoors dining or reading the paper, then it is probably safe to extend your awning. Some awning owners affected by harsh winter conditions remove their loose-hanging valances for winter storage, while others just keep their units retracted. Some owners use their awnings all year long, while others choose to use a winter cover on their awning for extra protection in the colder months. Durasol offers several optional hoods designed to provide protection from the elements when structural protection is not available. Hoods are most common where the awning is roof mounted or fascia mounted and it's not located directly under a soffit or overhang. Durasol recommends incorporating a protective hood with any motorized awning. Retract your awning when you're not using the area that the awning covers. Keep your awning and screens clean. The fabrics used in the products we sell are mildew resistant, but mildew damage can occur if dirt or other foreign materials are left to accumulate on the fabric. Keep shrubbery and vines away from your awning. Some plants secrete acids that can damage the fabric and/or hardware. Check awning frames for rust. Although rust is unlikely, it can cause deterioration of the frame and lead to fabric stains. Don't use force to retract or extend a crank-operated awning. Don't allow standing water to accumulate on your awning. Using a soft broom, gently push upwards from underneath the awning to push off the pool of water. Don't operate your awning in freezing weather. If frozen, wait until it thaws naturally before retracting. Don't subject your awning to direct flames or hot temperatures. Grease and smoke may coat and discolor the fabric. Don't use strong solvents or spot removers as they can damage and discolor the fabric. Don't use pesticides on the fabric as they can impair water repellency and cause staining. Retracting and extending an awning or screen several times in quick succession may activate the thermal cut-out switch that prevents the motor from overheating. After the motor has cooled down, it will reactivate itself. Moving parts and springs may creak if your awning has not been used for a while, especially if the weather has been cold. A silicone spray lubricant carefully applied to moving parts will help eliminate some of the noise. As the awning "breaks in" the fabric may stretch a little, requiring that the limits be reset to maintain the proper fabric tension. Cleaning your retractable awnings and solar screens preserves and extends their good looks and service life. A regular cleaning schedule starts the first year that you have your awnings or screens. About once a month, rinse your awning or screen with a garden hose. Allow the fabric to dry completely before retracting the awning or screen. Keep the underside of an awing clean by brushing it with a clean household broom. Regular maintenance generally means a once-a-year cleaning, with additional care if stains or soiling appear. Before cleaning any awning fabric, consult the fabric manufacturer for proper cleaning instructions. Clean the underside of the awning by gently brushing with a soft brush/broom. Using a stiff, dry brush, remove all debris and dirt. Using a garden hose, gently rinse the topside of your awning, always keeping the water stream away from the motor. If necessary, remove any small persistent marks using a soft brush or cloth and a mild, non-detergent, non-bleach soapy solution. Rinse carefully and thoroughly with clean water. Film left on the fabric will leave marks and a chalky residue. If the fabric finish or waterproofing needs reconditioning, use an approved conditioning solution. Allow the fabric to dry completely before retracting the awning. Before cleaning any screen fabric, consult the fabric manufacturer for proper cleaning instructions. Remove all debris and dirt by gently brushing with a soft brush/broom. Using a garden hose, gently rinse the screen, always keeping the water stream away from the motor. Allow the fabric to dry completely before retracting the screen. Call 916-764-5900 today for a free in-home consultation. Auburn, Folsom, El Dorado Hills, Cameron Park, Shingle Springs, Davis, and Woodland.